The Black Diamond District of the Utah National Parks Council, Boy Scouts of America, honors modern-day visionaries who perpetuate the beliefs of Scouting's Founder, Sir Robert Baden-Powell, with their donations. Keepers of the Flame is a giving society dedicated to supporting Scouting at the local level. To honor those who give, artist Jon McNaughton created Sacred Fire. 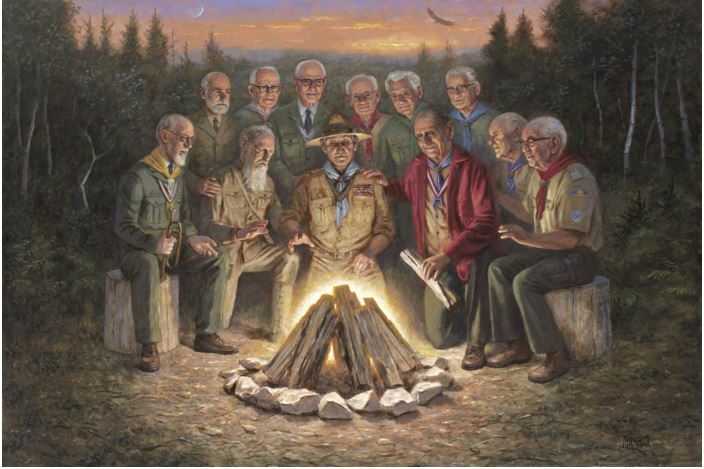 This masterpiece depicts Sir Robert Baden-Powell in a campfire setting with LDS Church Prophets involved in Scouting from Joseph F. Smith to Thomas S. Monson. "We only have a short time to live, so we must do things that are worthwhile and do them now." Keepers of the Flame commit to an annual gift for three consecutive years. Can you support Scouting at one of the following levels? Your support as a Keeper of the Flame can be focused on Scout Camps (Capital Campaign), Supporting Scouting in the Local Area (Friends of Scouting), and/or Maintenance & Investment (Endowment Fund).